Eng 268/10 in 49.5 overs. Ind 269/2 in 40.1 overs. 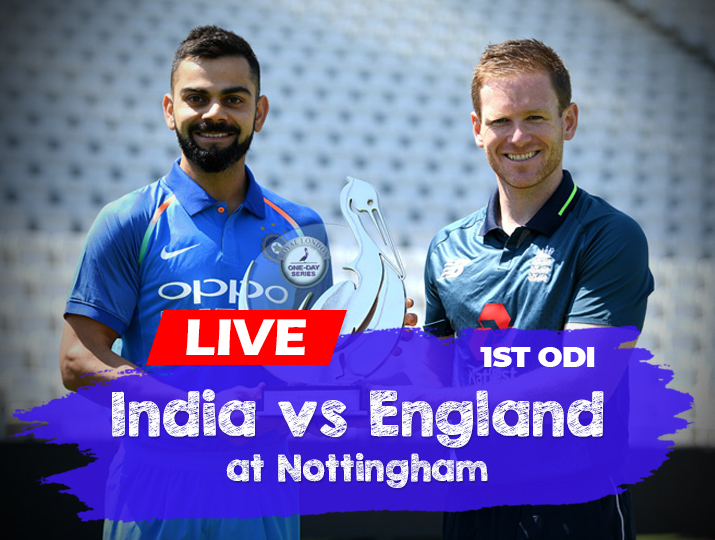 India vs England 1st ODI match 2018 being played in Trent Bridge Nottingham on 12 July 2018, India won the toss and opt to bowl first in this 1st ODI of India tour of England series 2018. Kuldeep Yadav was on fire again in this and he got 6 wickets. England started with an aggressive mind and scored runs with very good run rate but due to the best bowling of Kuldeep Yadav, 6/25 lost all the wickets before 50 overs. England scored 268/10 in 49.5 overs. Kuldeep Yadav has given his best performance of his cricket history. India won by 8 wickets. Rohit Sharma 127 not out. England started well but after 1st Powerplay lost the wickets in regular intervals, and scored 268/10 in 1 bowl left of the inning, that means in 49.5 overs. Jos Buttler and Ben Stocks played the great inning for England and both the players assembled half-century. Jos Buttler 53 off 51 with 5 boundaries, Ben Stocks 50 off 102 delivery with 2 4s. Stocks played like a test match. Jason Roy and Jonny Bairstow scored 38 each. 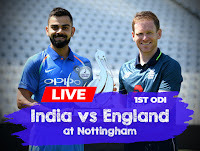 Adil Rashid 24, Moin Ali 22, and Eoin Morgan gave the support of 19 runs to reach England's total 268/10 in this India vs England 1st ODI cricket match. Kuldeep Yadav did best in this match and got the wickets of more than half of England's players. He got 6 wickets and has given only 25 runs in his 10 overs spell. It was his best performance 6/25, in Cricket ODI life. Umesh Yadav got 2 wickets but very expensive, gave 70 runs in his 10 overs spell. Chahal dismissed 1 England's batsman. Shikhar Dhawan and Rohit Sharma started the inning for India, Both the players played fantastic and blasting inning. Unfortunately, Shikhar Dhawan lost his wicket and scored 40 off 27 with the help of 8 boundaries. Rohit Sharma again played an amazing inning and added 1 another half-century in his no of the half-century in ODI. Virat Kohli also played great and reached the score 153/1 in 23.1 overs. Virat Kohli also finished his half-century and scored 75 off 82 with 7 4s. Rohit Sharma again played an amazing inning and finished century. He scored 127 off 114 in which he smashed 15 4s and 4 6s. With the help of Rohit Sharma's unforgettable, fantastic and blasting inning India achieved winning target in 40.1 over for the loss of 2 wickets. India scored 269/2 and won this India vs England 1st ODI by 8 wickets.